I’m going to start things off with Blades. While he is by no means a lacking toy I do feel he is the least impressive of the 4 protectobot deluxes, so I’m gonna be getting him out of the way first. In Vehicle mode Blades is a red and white coastal rescue helicopter…with missiles. Now there are apparently such things as fire retardant/fire dispersion missiles, so this can be forgiven. 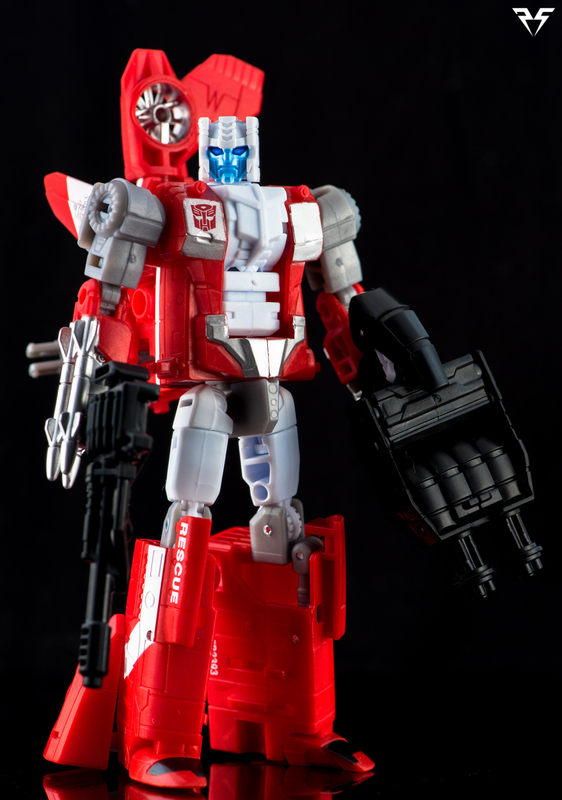 If you’ve gotten your hands on the Aerialbots already you’ll notice that Blades is mostly a repaint of the already released Alpha Bravo. Blades has a new head and a bunch of new tampographing work including a gorgeous Autobot Coastal Rescue crest on his tail fins. The rotor spins and he looks like a helicopter… not much more to talk about in this mode. Blades robot mode showcases as lot more white and grey to help balance his color palette. With the exception of the head and paint applications he is functionally identical to Alpha Bravo. His side mounted missiles become wrist/fist mounted weaponry in robot mode and his face is plastered with the biggest scowl I’ve ever seen on an Autobot. This mold and headsculpt definitely fits the aggressive personality of Blades. He has a nice crisp Autobot insignia tampographed on his chest to complete the look. Blades comes with the same 5mm Machine Gun accessory and gatling gun combiner weapon as Alpha Bravo (are you surprised yet?). While not an official accessory, I disconnected his rotors and filed them down to become handheld swords to add a little more variety to Blades next to Alpha Bravo. He can hold his combiner weapon and machine gun with ease, though they both look awkward for his frame and his "protectobot" designation. In vehicle mode he can mount either weapon on a 5mm port on his underbelly. He also has 5mm ports near his tail rotor that can accommodate his machine gun. To me they look strange no matter where I put them so I prefer to set them to the side. Final Thoughts Blades is a fun addition to the Combiner Wars line. Those who already picked up Alpha Bravo may not be too excited with the first of many helicopter repaints, though I think the new head and extensive recoloring and tampograph work really sets him apart from AB. It would have been nice to see a little more white break up the slightly monotonous red plastic but otherwise I’m satisfied with Blades and he is a welcome start to the Combiner Wars Protectobots.